This salad celebrates the abundance of harvest time with crunchy croutons, spicy seeds and colourful cranberries. First make the croutons. Preheat your oven to 375ºF (190ºC). Turn on your convection oven if you have one. Sprinkle the baguette with water then toss with the olive oil. Scatter on a baking tray and toast in the oven until golden brown, 15 to 20 minutes. The water will add interior chewiness while the oil crisps the outside. Meanwhile, prepare the cranberries by tossing them with the vinegar and sugar. Let them stand for 30 minutes or so to rehydrate and soften. Strain through a sieve. Next turn your attention to the pumpkin seeds. Lower your oven to 350ºF (180ºC). In a small saucepan over medium-high heat, bring the water, salt and sugar to a boil. Add the pumpkin seeds, cinnamon, allspice, and clove and bring to a simmer. Reduce the heat to low and continue to simmer for 10 minutes, allowing the seeds to absorb the spicy broth. Strain the seeds through a sieve and scatter the on a parchment-lined baking tray. Bake until lightly toasted and crunchy, about 10 to 15 minutes. 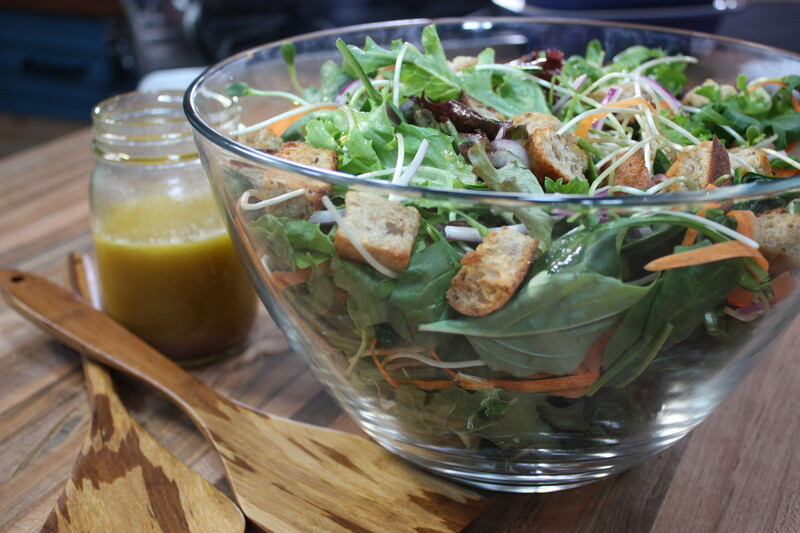 Make the vinaigrette. Place the oil, vinegar, honey and mustard in a 2 cup (500 mL) mason jar, tightly seal and shake vigorously until smooth combined. Alternatively whisk together all the ingredients in a bowl. This vinaigrette is good for months in the fridge – but it’s too tasty to last that long! Finally, assemble the salad. Toss all the salad ingredients together in a large festive bowl. Dress with just enough apple cider vinaigrette to lightly coat. Garnish with the crunchy croutons, spicy seeds and colourful cranberries. Serve and share. 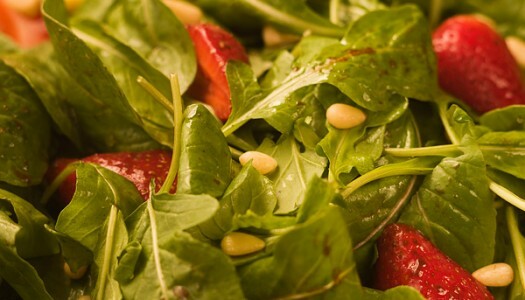 This salad features one of my all-time favourite flavour combination: peppery, nutty arugula leaves tossed with sweet, fragrant strawberries, mellow balsamic and sweet pine nuts. Together these ingredients are far more than the sum of their parts. I love salmon. 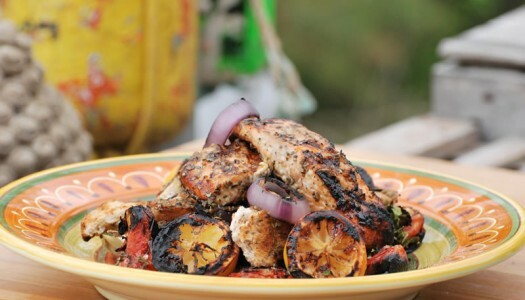 I love its flavor, I love how healthy it is, and I love how easy it is to cook. I especially love it grilled, then tossed into a simple salad. And since the grill is already on, why not grill the whole salad?